Hearts head coach Robbie Neilson believes Juanma Delgado must learn how to handle the rough and tumble of Scottish football. 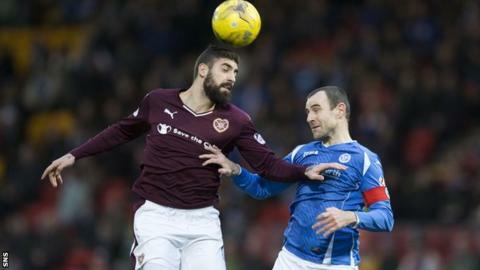 Juanma was sent off in Saturday's 0-0 draw with St Johnstone for head butting David Wotherspoon. "He is a big boy and he gets targeted a lot," explained Neilson. "It's difficult for him coming from a different culture and there are things that happen on the pitch that in Spain [result in] a free-kick." Neilson was unsure if indeed the decision by referee Kevin Clancy was the right one. "From where I was 10 feet away I didn't think it was a red card," Neilson said. "They were very quick to get him off so I'm sure they must think it was. "It takes time for these players to realise what you can and can't do. He is going to miss the next two games and hopefully when he comes back he realises there is a lot of physical contact in Scotland." Saints boss Tommy Wright was pleased with the effort from his players and the number of chances his side made in the game. St Johnstone were also awarded a late penalty but Steven MacLean lifted his effort well over the bar. "Murray Davidson on another day might have had a hat-trick, Michael O'Halloran as well," said Wright. "[We were] up against a goalkeeper [Neil Alexander] who made at the end two saves with his feet and being an ex-goalkeeper I know that is not luck. "We should have won the game, of that there is absolutely no doubt."